She yn chaayr bun-chooish y duillag shoh. My ta sym ayd ayns keeall elley yn 'ockle shoh, lhaih York Noa. Ta York Noa (Baarle: New York) ny valley smoo ayns ny Steatyn Unnaneysit lesh ny smoo na 8 millioonyn cummaltee echey. V'eh bunnit liorish y Çheer Injil ayns 1625 myr stashoon traghtal, as v'eh ny valley smoo veih'n vlein 1790. V'eh ny chied ard-valley rere y vunraght. Ta York Noa rheynnit ayns queig baljyn corpagh: The Bronx, Brooklyn, Manhattan, Queens as Staten Island. 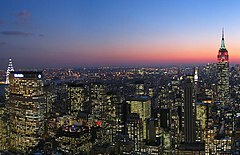 ↑ Why is New York City known as “the Big Apple” and “Gotham?”. Dictionary.com, LLC. Feddynit er 2011-02-04. ↑ the Mayor, New York City Office of (2010-01-08). Biography. New York, City of. Feddynit er 2010-01-08. ↑ Population Change for the Ten Most Populous and Fastest Growing Metropolitan Statiscal Areas: 2000 to 2010. U.S. Census Bureau (March 2011). Feddynit er 12 April 2011.